Todour 2.01 is up on the server for both windows and mac. Please download and give it a try. New in this version is the support for dates (can be turned on in settings), a bunch of bugs have been removed and the mac version is now up to the same standard as the Windows version. This entry was posted in Productivity on December 22, 2015 by sverrirv. For quite a few years I’ve had Todour available for anyone to download. It’s software I make for my own use and I’m happy to share it but I can’t help wondering how many people are actually using it, and on what platforms. How many people care if I make an update? I have had no tracking of downloads on my page, but that wouldn’t really have mattered anyway as it says nothing about who uses the software and also the software is available for download in other places. To get a better view of this I have, from version 2.01, added google analytics into the application, hoping that it doesn’t offend anyone. The analytics can be easily turned off of course and it only gathers very basic data. I hope this will give me more insights into how many people actually use the software to understand if there is interest in keeping developing it (it’s does most of the things I need for now). This entry was posted in Productivity, Programming on December 22, 2015 by sverrirv. I wonder how this one passed me by, but today I found this thorough tutorial on the todo.txt format by Zach LeBar. He explains in detail how to use the format and he mentions Todour in his article. I highly recommend it for anyone wanting to know more about using plain text files for managing his/her todo-list. This entry was posted in Productivity on December 20, 2015 by sverrirv. 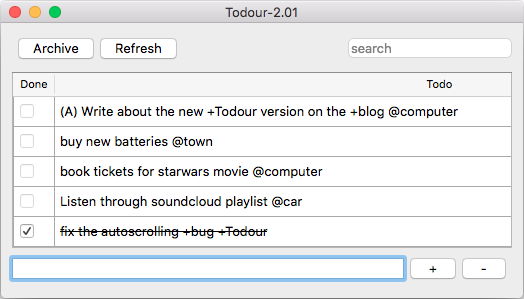 Todour v2.00 has been published for windows now. This entry was posted in Productivity on December 14, 2015 by sverrirv.